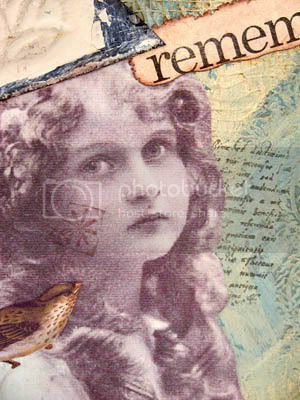 Gail Schmidt is the amazing talent behind Shabby Cottage Studio. We were recently blessed with Gail's talent when she redesigned the layout for our ning site at Etsy Cottage Style, and with the inauguration of Gail's latest endeavour, the inspirational blog, Mind Wide Open, we thought it was an ideal time to get to know a little more about Gail. You have a background in art with over 15 years spent as a decorative painter, muralist and faux finisher before you made the transition to mixed media art. Where did you receive your training and your desire to spend your life in artistic pursuit? What did you find satisfying in this realm of art? I think I was born with a need to create. I spent many of my early adult years being frustrated sitting behind a desk feeling this need and not knowing how to fill it. You see I had a misconception about talent. I never thought I could be an artist because I truly thought artists spring from the womb, not only knowing they were an artist but already knowing how to create their art. LOL Maybe it came from the term “God given talent” I always used to hear. And since I wasn’t just “magically” producing art then I must not be an artist. I can be very naive at times. I took workshops and classes whenever time and money permitted. I took a number of faux finish workshops from a wonderful and well known artist in the faux finishing industry. I loved playing with textures and layers. One thing I found satisfying from learning to paint was I discovered I have a pretty good eye for composition. And the other thing I found satisfying, aside from watching my hands create something from nothing, was simply that I found I had the “talent” to create. I was an artist. To this day I still enjoy saying that. You can call me what you want I call myself an artist. What drew you to mixed media art? To be honest it started out as something else and in the middle took me by surprise as it grew into love. I had a very serious burnout with painting. I had feelings of burnout before but always managed to find my way back. Which I thought was happening again. I had closed my shop, stopped teaching and began painting and selling on Ebay. I was looking for a little giftie something to add to my packages when I shipped them. Somewhere I had been hearing the term altered tags. I don’t remember the particulars. Since I am a huge “Googler” I did a search. I started playing with materials and ordering some fun embellishments. About that time I also was realizing this time my burnout was very serious. I began to feel depressed when I thought about painting. It became a heavy weight on my shoulders. I decided that I needed to put my brushes down and become involved in something else creative so that possibly one day I would want to pick up a paint brush again. And so I began to follow this new journey of glue and scissors and paper. And one thing, as it usually does, led to another. You have also made the transition to digital art, and were featured in the premiere issue of Somerset Digital. What inspired you to become more focused on digital work? Oh my gosh. I am so addicted to creating digitally! Again, following the path of paper, scissors and glue I began collecting images and printing images I felt a need to do more with them. I have a photographer friend who sat down with me one day a couple years ago, and showed me how to use my Photoshop Elements for more than resizing and printing! I have literally been creating digitally since that day. I read a lot about techniques and then try them out. I love the artistic freedom I can achieve without having to labor for days or weeks. What do you find is the most significant difference between creating art manually vs. Digitally? I guess, like so many others, I love to see immediate results with some things. When I create manually a lot of work and time can go into just the prep work, the steps leading up to the actual creating of the art. Digitally I can get there much sooner. And actually do things I may not have the skills, or technique knowledge to do manually. As I mentioned earlier, I love layers. To me it’s all about the layers, the depth one can achieve in their art. Digitally I can layer to my hearts content. And see how it will look immediately. If I don’t like it, pffft, delete it and try something else. What are the things/people/places/events that you find most inspiring to your creative muse? I love creative people period. Being around them, reading about them, talking to them…it sparks a creative synergy I’ve seen come to the fore over and over. I always am at my most creative in these kinds of situations. I’m also pretty visual when it comes to being inspired, I love colors, and textures, and it doesn’t matter in what form, it could be anything that might spark me: a picture in a simple catalog or a magazine, a painting, a photograph, a walk in the woods, a stroll around my flowers beds just something I catch in the corner of my eye in passing. And now, with the enormity of the creative blogging world, sometimes I am on overload of inspiration! You have taught painting and had a brick and mortar store. What was the most enriching aspect of this period in your life? You are the owner and head of creative genius at Shabby Cottage Studio, a wonderful online store for art and creative supplies. When did you open Shabby Cottage Studio and what lead to your decision to branch into this area of art? Okay Sherry, I’ve been called creative lost of time and I’ll take that. Genius! LOL Oh no, absolutely not. But admittedly I think I have a shopkeeper gene residing in me somewhere. I used to have a dream of having a beautiful little store and living in a beautiful apartment above it. One part of the dream came true. I had an adorable little shop. But we moved to the mountains of Tennessee and I set up shop and studio again but it just wasn’t working for me in the new location. For a various reasons I chose to close my doors. So now I live in a shabby old farm cottage we’re slowly trying to fix up. We live very rurally and trying to get a decent job in this area is difficult at best. I knew I wanted to try my hand at an online shop but what to sell, what to sell. Your latest endeavor is Mind Wide Open which was launched at the end of June and has already been widely and popularly received. Tell us a little bit about the concept of Mind Wide Open. Gosh, I’m gabby aren’t’ I?! Okay, face it, when you own a business you have to always be thinking about good ways to market that business. Mind Wide Open was actually born as I was casting about for ways to make my shop more interactive and the name more familiar to people, to let people start to “see” the person behind the shop, plus I’d been wanting to do come up with some contests for quite a while. I’ve been enamored of all the challenge blogs out there for quite a while but being busy with the shop I usually don’t get time to play. Talking with my design team, challenges were brought up as a good fun thing that people like. My ears perked up and my little brain started to percolate. Marry a contest with a challenge! But once I had the name Mind Wide Open, it seemed to take on a life of its own. We had just over 5000 hits in the first three weeks! I think that is wonderful for a brand new blog! We had 33 entries for the first challenge contest and over 100 voters! The contest is simple, I provide an image and a word prompt, everyone interprets it their way in their medium The results were stunning! us People loved the idea of being able to see all the entrants’ images and were inspired to see how so many people treated the same image. What vision do you have for the future of Mind Wide Open? What advice or inspiration would you give to those who are starting out on a similar path, both with art and with trying to sell the work that they do? I think when it comes to art I would say, try a lot of things, don’t ‘be afraid to experiment and for goodness sake be willing to make mistakes, and be open to possibilities because you never know where they will come from or what form they will take. But if you’re open to them, they might allow you to fly. You know that old saying, when a door closes, a window opens? It’s true. I’ve seen it happen in my life over and over. When it comes to selling one’s art? I’ll be honest, it can be tough. When economic reality hits, people spend their money on what they need, not what they desire so art sales flag. Be ready to go with the flow, things go down, but they come back up too. You have to find ways to weather those ups and downs, maybe branching off into something else, adding different items to your inventory, finding other venues where you can sell, spread yourself and your name out there. Some will disagree with me but I don’t subscribe to the “build it and they will come” theory, except for the lucky few. People have to know you’re there before they can find you. Especially on the internet! You have to be willing to promote yourself and your work. I read somewhere that when you sell online statistics show people visit a site a minimum of 8 times before they purchase. You have to make sure your site is always fresh, well stocked, up to date and is easy for people to understand and navigate. I also believe you have to give excellent customer service and fast shipping. You’re competing with a lot of others. It takes time and hard work but if you have a passion for it, the deep satisfaction achieved is worth all that hard work. My store is slowly growing as is my customer base, but I’m nowhere near where I want to be yet. But it’s been fun working toward that goal and I will continue to do so. Thank you Gail for taking the time to share your thoughts and experiences with us. To see what Gail has to offer at her studio and on her etsy shops, click the link to Shabby Cottage Studio, and don't forget to check out Mind Wide Open if you haven't already been there. *all images are the property of Gail Schmidt and have been used here with permission. Great interview! I believe the same thing about writing--the majority of people think that you're "born with it," but it's really a skill that you can hone and work to perfect. It's more about the doing than the title. Thanks Gail! Sherry, thank you--I really enjoyed this interview. Amazing interview Sherry with our lovely Gail :) It has been so nice to read all about your artful journey to where you are today. I think a lot of us creative people go through the same changes through the years, we go from being passionate about one creative outlet and on to another. I think that is the key, never to be bored, there is always more to learn out there and be in love with. Sherry - Great idea to interview Gail. Well done too! Gail - Boy can I relate to all that you shared in this interview! ~ Your entrepreneurial spirit: I CAN IDENTIFY WITH THIS, I WAS SELF EMPLOYED FOR FIVE YEARS & WAS BURNED OUT. I'M FINDING MY WAY BACK. We are all so lucky that we have blog land, a virtual playground that allows us to meet and to share the creative journey. You are doing amazing things. Thank you! I want to thank all of you for your wonderful comments about my interview. Sherry is a wonderful interviewer and makes me look good. ;-) And Kathryn you are oh so right, we are so lucky to have blogland! For those of us who work or live in more isolatinthan others and do not have a local supportive art community and art friends blogging has been a saving grace for so many of us. First of all, what a great interview. It's been fun reading about Gail. I recently discovered her blog and it is one of my favorites! I love Mind Wide Open... it has challenged me to get in touch with my artistic side again. Such fun. Also, is the "hydrangea" at the beginning of the article available somewhere? I love the image. Thanks again for a wonderful interview with Gail!